Organised local forest and farm producers are at the core of a sustainable future. The sheer numbers of local smallholders, communities and indigenous peoples who know and love their forests and farms offers transformative scale. They generally want to build their own enterprises that improve livelihoods, sustain and restore the natural resources that underpin them and secure intergenerational communities and well-being. The Forest and Farm Facility (FFF) is a unique funding platform that directly supports forest and farm producer organisations to achieve these local aims. 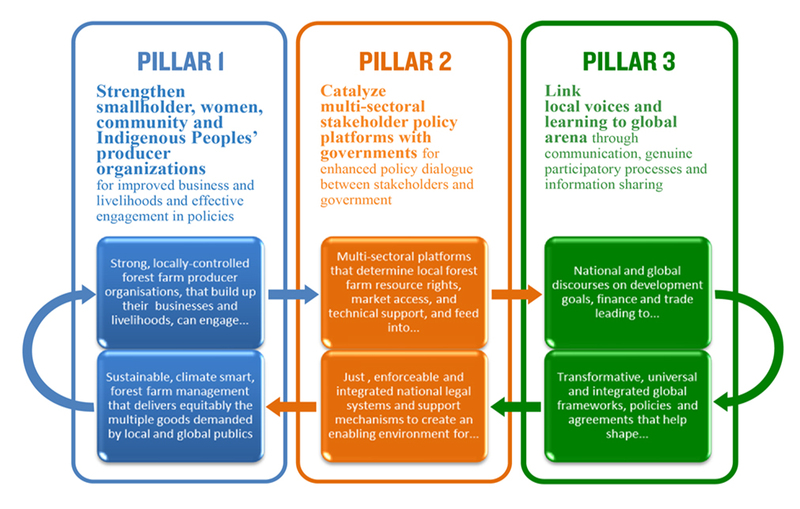 FFF believes that strengthening the horizontal and vertical linkages between such producers and their enterprises has tremendous potential for scaling up: policy influence (to secure commercial forest rights); entrepreneurial capacity (to grow diversified green economies); technical and ecological know-how (to restore landscapes and adapt to and mitigate climate change); and social organisation (to maintain and enhance cultural integrity). The vision of the FFF is transformation at scale – the millions of small-scale forest and farm producers worldwide, if well organised, have immense transformative power. The FFF aims to help them harness it. Phase I used a framework known as investing in locally controlled forestry that recognises four essential enabling investments are necessary prerequisites to attract asset investment: securing commercial tenure; improving business capacity; enhancing technical extension; and strengthening producer organisation. In short, the facility helped producer groups join, organise, collaborate with or form federations, assisted with business development and policy engagement, and facilitated cross-sector dialogue on how to improve support at government level for businesses run by groups of producers. The FFF is a partnership overseen by a steering committee that ensures representatives of local forest family, community and indigenous rights-holder groups take control. FFF Phase I had global and regional programmes alongside national work in 10 partner countries: Bolivia, Gambia, Guatemala, Kenya, Liberia, Myanmar, Nepal, Nicaragua, Vietnam and Zambia. After a competitive call, Phase II is continuing with five of these programmes and introduce national partners in Ecuador, Ghana, Madagascar and Togo. A knowledge and learning component led by IIED dovetailed with the communication strategy – including a dedicated FAO website. IIED was also responsible for the FFF's monitoring and learning system capture in its annual reports. Following the tangible success of FFF Phase I, including improved livelihoods and knowledge generation, July 2018 saw the launch of FFF Phase II, which aims to build on and scale up support for the millions of small-scale forest and farm producer organisations. Annual reports: Read how effective the FFF approach is in the 2017 Final Report, 2016 Annual Report (PDF), the 2015 Annual Report (PDF) and the 2014 Annual Report (PDF). 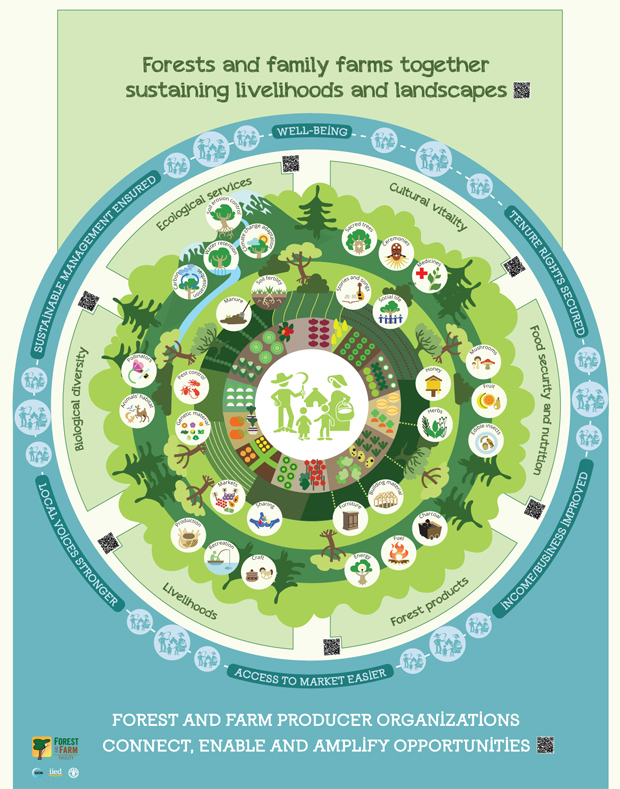 Download an FAO infographic (PDF) that illustrates the relationship between forests and family farms and highlights the advantages of forest and farm producers getting organised in order to improve the access to market and the income, to amplify their voice in decision making, and to ensure tenure rights, and human well-being. IIED's involvement in the Forest and Farm Facility management team was funded by the Department for International Development (DFID) and the FFF donors, including the governments of Germany, Sweden, Finland, the US Department of State, AgriCord through its Farmers Fighting Poverty Programme, and funds from the EU-FLEGT programme and FAO through the FAO Multi Partner Programme Support Mechanism (FMM) (supported by Belgium, the Netherlands, Sweden and Switzerland).